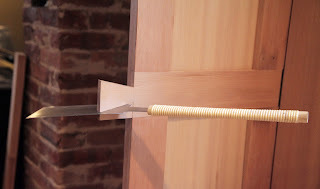 Some built-in pieces can be fabricated and dry fit in the shop and then permanently installed on site. 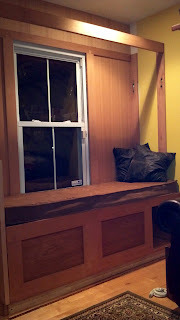 This process works well in many situations but occasionally (especially in older homes) the walls, floor and adjoining surfaces are so out of level and square that it makes more sense to custom fit the furniture in place. Our home is well over a hundred and ten years old, and even though I have gutted and renovated the entire inside I kept almost all of the original framing on the exterior walls. 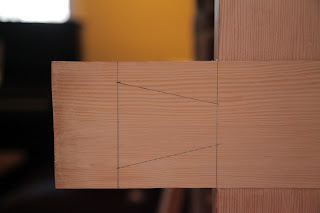 This old framing makes for wavy walls and ceilings, which in turn, encourages frustration upon installation of anything with a straight edge. Between a big bucket-o-shims, miles of scribe lines, and patient sawing, I have been slowly (very slowly) constructing an entertainment center from salvaged Douglas-fir in my family room. The Cushion Fits...Maybe A Nap? The hardwood skeleton of this creature is straight grain, old growth Douglas-fir salvaged from doors that came out of an old row home in Baltimore. 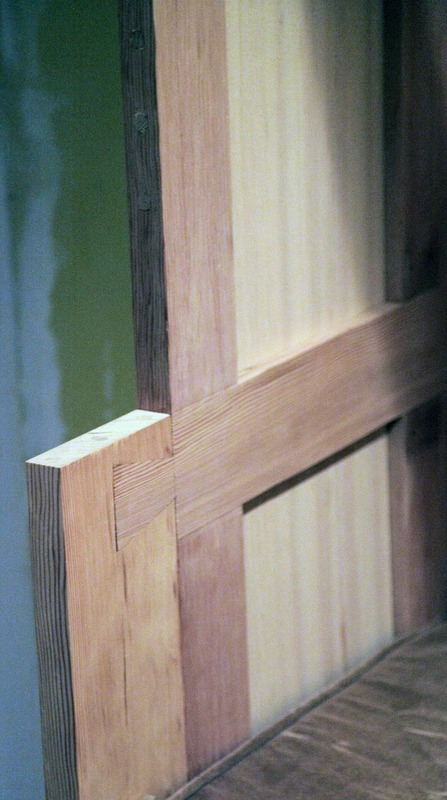 The existing mortises in the door frames for locksets and hinges has required some creative construction techniques but has brought an enjoyable character to this piece of furniture. I managed to find some extraordinary straight grained Douglas-fir plywood from Exotic Lumber Inc., a local supplier. I am in no way affiliated with this company, but I did have a good experience with my order and I'd recommend them if you happen to be in the market for something...exotic. 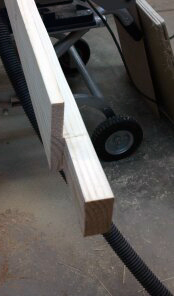 As I have found many, many times before I was not only able to keep the mess down inside by using handtools, I was also able to make some very complex cuts in a matter of minutes without having to resort to overly complicated jigs and fixtures (all while my 1 year old slept like...a baby...). 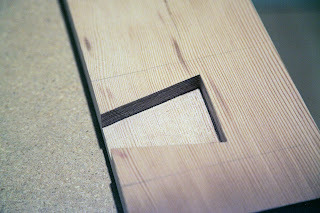 When working with Douglas-fir, I also strongly recommend low angled razor sharp tools as they tend to make much cleaner cuts in this type of lumber. I try to use meat powered tools as often as I can, mostly because they are quiet, accurate and offer me a chance to get lost in my work. These L.N. 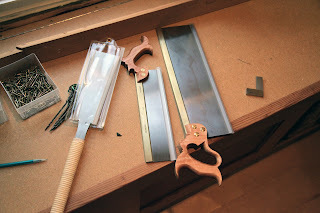 handsaws are some of my favorites, it is as if the handles were made just for my hands. The metal tools under the Japanese Pull saw are called gimlets. Gimlets are basically hand turned drill bits. I got this set from Garrett Wade and I use them all the time, in fact, they usually reside on my toolbelt suspended by a miniature D-ring (they are in fact slightly lighter than a drill). These will get a detailed blog post shortly...I can hear the squeals of sarcastic excitement from here. I am using a lot of decorative dovetails on this project. Only a few of these dovetails are actually structurally important, and the ones that aren't I am distressing a little so they appear worn (this makes cutting them loads easier as well, as they don't have to be absolutely perfect). So far, this project has been coming along well, but it will likely take a while to complete so there will be regular updates on progress (once again, I can hear the shrill sardonic squeals of excitement). Now To Wipe On A Little Finish? 2x4 To Support The TV.